for the past two decades, urban agriculture has been on the rise throughout the world, in both poor and wealthy nations. Millions of urban residents in Africa, Asia, Latin America, and increasingly in North America, are growing crops and raising livestock in yards, on rooftops and balconies, along roadsides, and on vacant urban land. Until recently, many countries had a strong government perception that agriculture is unsuitable for urban areas. Many district level governments, across the world, are concerned about the growing competition for land and water and incompatible land use. They try to discourage food production in urban areas in the belief that, in addition to competing for scarce valuable land, it contributes to problems of public health. Raising animals is especially discouraged. In stark contrast, the Cuban government has actively supported urban food production, especially in the capital, Havana. Cuba is the only country in the world that has developed an extensive state-supported infrastructure to assist urban food production. This infrastructure emerged in response to acute food shortage in the early 1990s. Its growth also got ideological support from the Cuban government's view that access to nutritious food is a basic human right. Following the Cuban Revolution in 1959, the new Cuban government made elimination of food scarcity through an elaborate national food distribution system a priority. This system functioned well to distribute food to the Cubans but, it was highly dependent upon food imports; 57 per cent of total food consumed in Cuba was imported from the erstwhile Soviet Union. With the Soviet Union falling apart in 1989 all food imports were lost leading to immediate food shortages in Cuba. It also lost its source of critical agricultural imports like fertilisers, pesticides, tractors, its spare parts and petroleum on which depended its national food production system. Lack of petroleum brought the food distribution system to a halt; severe fuel shortages meant that food could not be refrigerated or transported by trucks from the suburbs and rural areas. The us made the situation more difficult with the passage of the infamous Toricelli Bill in 1992. The bill banned trade between Cuba and foreign subsidiaries of us- based companies and threatened to confiscate ships that touched the ports of both Cuba and usa within six months. Since food material made up for most of this trade, the Toricelli Bill worsened the situation considerably. By the end of 1992, food shortage had turned into a crisis throughout Cuba, including Havana, home to 2.2 million Cubans and the largest city in the Caribbean. Like many large cities, Havana was completely dependent upon food imports brought in from the Cuban countryside and abroad. Havana had no food production capability or infrastructure and almost no land for farming. Worsening food shortages motivated citizens to plant food crops in the yards, patios, balconies, rooftops and vacant land sites near their homes. In some cases, neighbours got together to plants crops -- beans, tomatoes, bananas, lettuce, okra and eggplant. If space permitted they kept animals -- chickens, rabbits and pigs. Within two years, every neighbourhood in Havana had gardens and farms. By 1994 hundreds of residents were involved in food production. The majority of these urban growers had little or no access to much need agricultural inputs -- seeds, tools and pest control devices. They were also unaware of the small-scale, agro-ecological techniques that urban gardening requires. Government support The Cuban ministry of agriculture responded to people's need for information and agricultural inputs by creating an urban agriculture department based in Havana. The departments' goal was to put to use all of the city's unused land for cultivation. It brought in agricultural specialists to help the citizens, ran short courses and made provisions for seed banks, biological controls and compost. Hundreds of vacant lots, pubic and private, were officially sanctioned as gardens and farms. In most instances, free and indefinite right to use public land for gardening was granted. The department also set up a network of 'extension agents' to respond to the varied needs of urban growers. The majority of these 'agents' are women, hired to work for the neighbourhoods they live in. Knowing the people helps. They continually encourage people to consider using available land for food production.They teach urban growers about small-scale agriculture techniques suited to urban food production and promote sustainable practices like using biofertilisers, composting and green manure for increasing organic matter in the soil, companion planting and biological controls. Currently, there are 68 'extension agents' working in small teams of two-seven in 13 of Havana's 15 urban districts. The department set up seed houses selling garden inputs, seeds, ornamental and medicinal plants, tree saplings (mostly fruit-bearing) and books on farming. The department also works with Cuba's agricultural research institutes to develop resources for small-scale, urban agriculture. There are 222 small-scale centres that produce biological control products to support organic agriculture throughout the nation. These centres culture microorganisms and use them to make biopesticides. Also laboratories in Havana produce a variety of organic biofertilisers that can be used in urban agriculture (see box: Biomeasures in Havana). This state-supported infrastructure for urban agriculture has allowed thousands of Cubans to be involved in the production of food in the nation's capital. Currently, about 30 per cent of Havana's available land is under cultivation and there are more than 30,000 people growing food on more than 8,000 farms and gardens in Havana alone. The size and structure of these urban farms and gardens vary considerably. There are small backyard and individual plot gardens cultivated privately by urban residents. 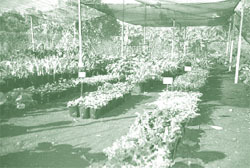 There are larger gardens on raised container beds cultivated by individuals and state institutions. There are work place gardens that produce for the restaurants. There are small family-run farms and farms owned and operated by the state with varying levels of profit sharing with workers. In 1997, urban farms and gardens in Havana provided 30,000 tonnes of vegetables, tubers and fruit, 3,650 tonnes of meat, 7.5 million eggs, and 3.6 tonnes of medicinal plant materials . Residents of Havana are also growing rice today. This small-scale rice production is completely unprecedented because in Cuba rice production, historically, has been carried out on large farms using industrial methods. Nationwide, small-scale urban rice production now equals that produced by large-scale, state-owned, farms in rural areas. There has also been a revival of interest in herbal medicines which is one of Cuba's burgeoning economic sectors. The growth of urban agriculture is the result of the Cuban government's commitment to making use of unused urban land and resources available to Cubans interested in farming. The issuing of land grants for vacant space in the city resulted in the conversion of hundreds of vacant lots into food producing plots. New planning laws place the highest landuse priority on food production. In addition to land grants, the Cuban government has ensured a market for the produced food and kept the cost low by ensuring direct sale from farmers to consumers. Unlike anywhere else in the world, in Cuba, deregulation of prices, combined with high demand for fresh produce, has allowed urban farmers to make better profits. To minimise growing competition for land the Cuban laws demand that any new construction that displaces an existing garden must finance the relocation of that garden. Although urban agriculture in Cuba is a response to an acute food shortage, the benefits have been far reaching. This case study can encourage other governments to develop strategies and policies that contribute to an urban agriculture infrastructure that promotes small-scale sustainable farming methods, allows urban growers to thrive, increases local food security and promotes ecological sustainability.